A.D.T. International provides D.T.P. services as your translation agency. D.T.P. (Desktop Publishing) encompasses all the computer processes that make it possible to create documents to be printed or posted online. In other words, D.T.P. means what your document layout looks like, whether brochures, advertisements, banners, flyers or logos, etc., so that they can be understood easily and look professional. D.T.P. is essential for processing bi-directional texts involving transition languages that use the Latin alphabet and those that read from right to left, such as Arab, Hebrew and Urdu. Our graphic designers must adapt the full layout of the documents using mirroring and researching style and typeface, etc., to improve their readability. A.D.T. International provides this desktop publishing service to complement your professional translation needs, or as a standalone service if your documents are already translated. We guarantee you'll receive the final product in the format of your choice. All that remains is for you to print or post it online. A.D.T. has an in-house team of graphic designers. This is key to our reactivity. 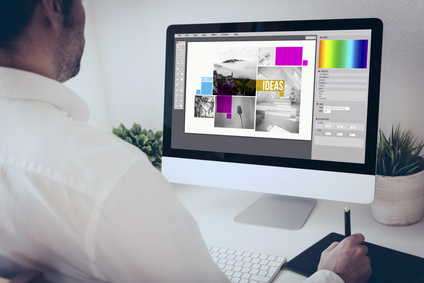 Our team perfectly masters standard design software such as InDesign, QuarkXPress, Illustrator, and Photoshop. Our graphic designers are happy to answer any questions you might have.